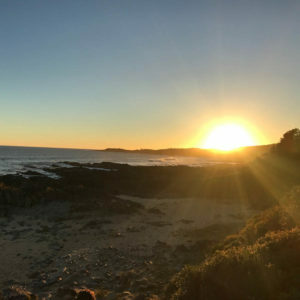 Guest Post : What Makes Cape Conran So Special? 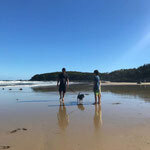 Welcome Guest Blogger Merryn Padgett who writes over at her family travel blog 3 Hours from Home. 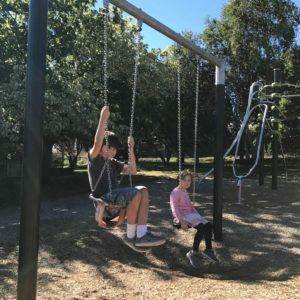 On their recent adventure they met a group of people who keep coming back to Conran. They met some forty-nine years ago at University, and continue to share camping experiences each year. Conran is at the top of their destination list. 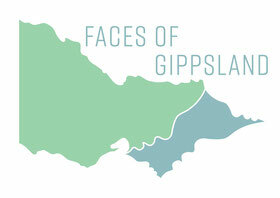 A sense of aliveness hits East Gippsland when the tourists roll into town. It’s so much fun to get amongst it, and talk to people about their experiences as they frolic around the region. Then there comes a time when you want to get away from it all. 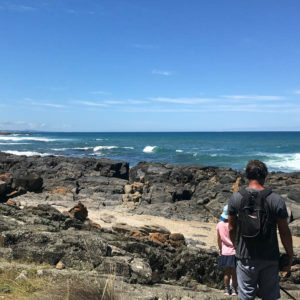 A mini-break to one of our favourite camping spots is high on the agenda when school goes back. Where do we go? 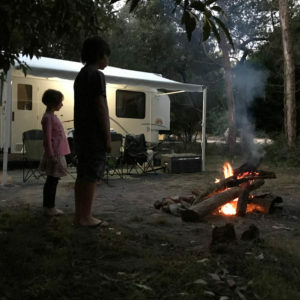 Banksia Bluff Campground at Cape Conran. 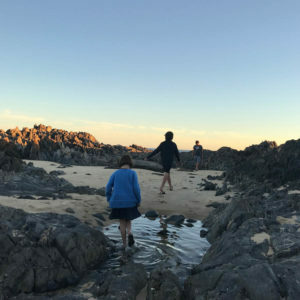 On our recent adventure we met a group of people who keep coming back to Conran because it’s so special. 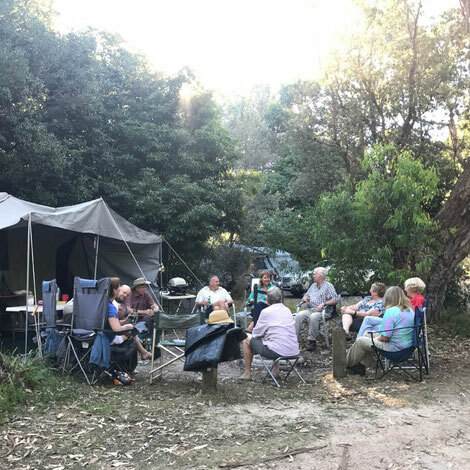 They met some forty-nine years’ ago at University, and continue to share camping experiences each year. Conran is at the top of their destination list. 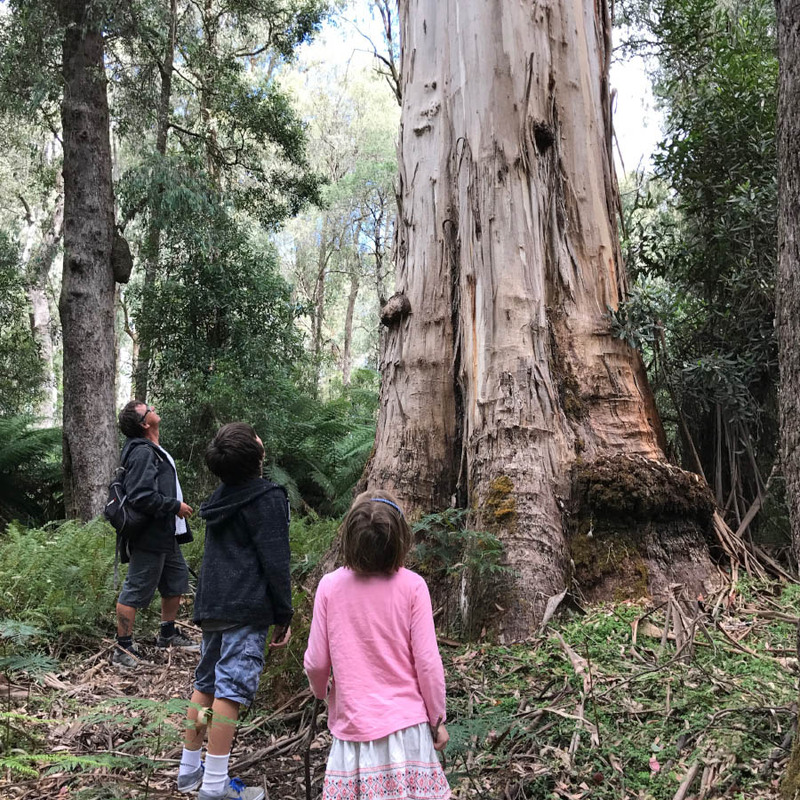 In the Cape Conran Master Plan, Parks Victoria articulate the three levels of experience succinctly. 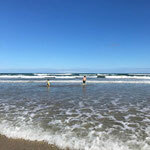 Roaring ocean sounds instantly soothe the soul. 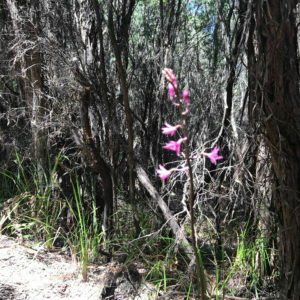 The wild, rambling bushland is dense and filters the morning sunlight. The open, spacious camp sites are a stark contrast to crammed caravan parks. 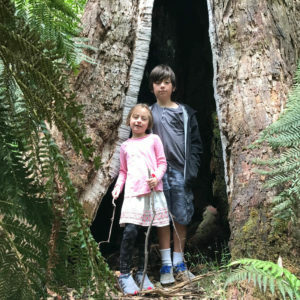 Wildlife flit, scamper and hiss all around the campground, offering a genuine natural experience. When you camp here, you’re connecting with a place that the Bidawal, Gunaikurnai and Monero People revere. The cultural connections make Conran special. 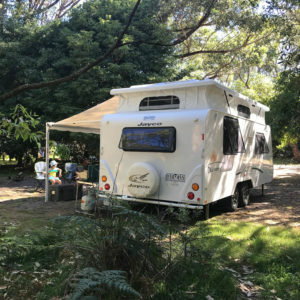 Diva the Discovery enjoyed her maiden voyage to Banksia Bluff Campground and served us well! 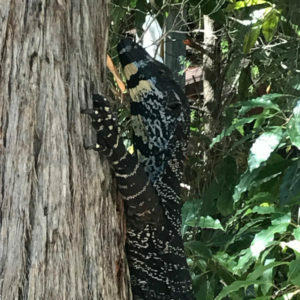 A day-trip to Goongerah was also on the cards. 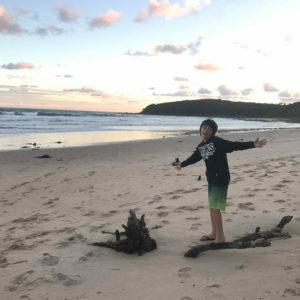 I’d been bugging Marcus to camp at Goongerah Campground since November last year! 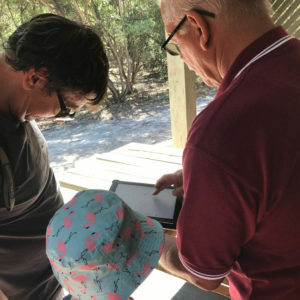 So we headed there to get a sense of the sites, then stopped to admire Rachael Pollac’s beautiful map at the Goongerah Community Hub. Next stop? 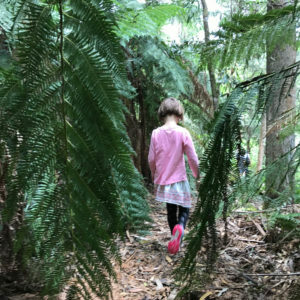 Gap Road Scenic Reserve in Errinundra National Park for an amazing bush walk through a very special forest. In the future we plan to complete the full walk, as it’s a 3-hour return trip and this time around we weren’t prepared. 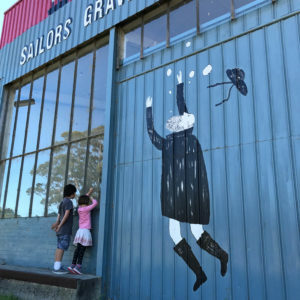 The kids loved playing at Forest Park in Orbost, and taking a peek in the windows at Sailors Grave Brewing and Snowy River Cycling. Famished, we dined at the Snowy Inn (Commonwealth Hotel Orbost) which was excellent. The meal sizes are exceptionally generous. A classic chicken parmigiana was perfect after a big day driving. Fresh double smoked ham, house-made breadcrumb, a crisp salad and tangy mustard vinaigrette washed down with a cold beverage. 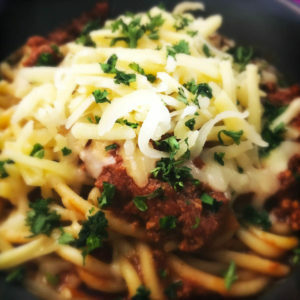 Miss Six loved her spaghetti bolognese and Quinn’s chicken nuggets were refreshingly house-made rather than processed junk. The service was awesome and we’ll always be back to the Snowy Inn! Quinn was stoked that Gorillaz and Hilltop Hoods had a place on the jukebox. On our last day, we took things slow. Relishing the Cape Conran pace, we woke when our bodies wanted and feasted on a hearty bacon and egg breakfast. 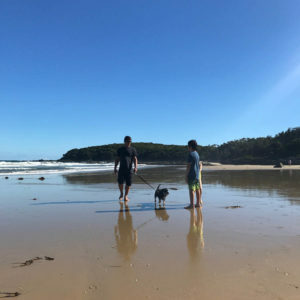 Quinn was given the freedom to walk our fur-kid, Lulu, along the beach. It was lovely to meet Geoff and Maree, a retired couple who were passing through on a little tour. 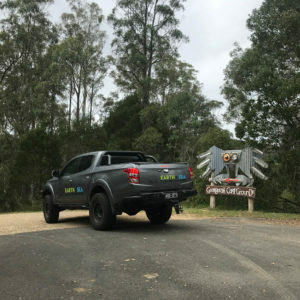 They have a connection with the Idlers 4WD Club and also facilitate clean ups on Aberfeldy Track. 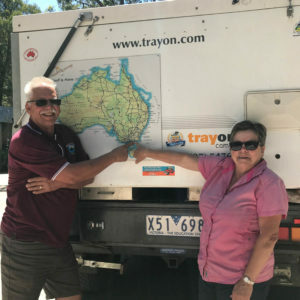 We swapped 4×4 adventure stories about all the iconic tracks and discovered how small the world is (Geoff and Maree also have a connection to Paynesville where we live). 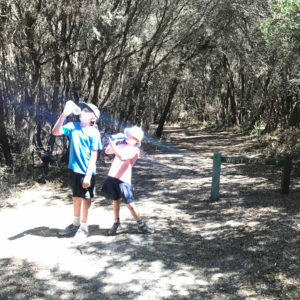 During the afternoon we drank in the sun along Cape Conran Nature Trail, crossing paths with one black snake and playing a lot of eye spy games! The ocean called. We heeded. 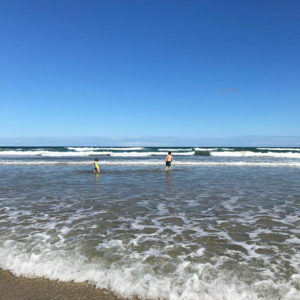 Spending treasured moments with the kids in the salt water soothed the soul. 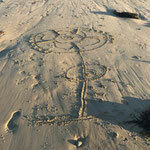 As did teaching Miss Six how to draw sand mandalas on the shore. Our next adventure here can’t come soon enough! There are 135 campsites spread out over 1 km. We camped in Section C, Site 70 which is excellent for larger vans and has direct beach access. 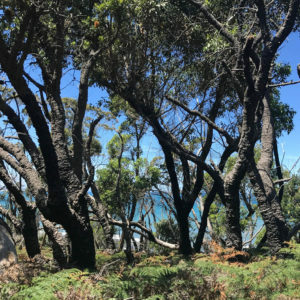 Cape Conran Coastal Park is located in far east Gippsland, approximately 420kms east of Melbourne and 530kms south of Sydney. 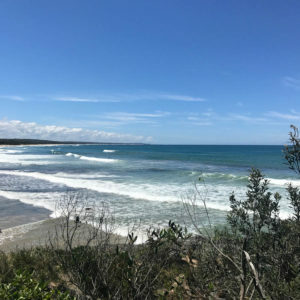 Cape Conran can be reached via the Princes Highway by turning off at Cabbage Tree Creek or via Orbost and Marlo to the west. The eastern section of the park can be reached by turning off the Highway east of Cabbage Tree Creek to Bemm River. From the south, turn off the Princes Highway along Combienbar Road, 54 km east of Orbost. Drive through Club Terrace to Errinundra Road which climbs onto the Plateau. 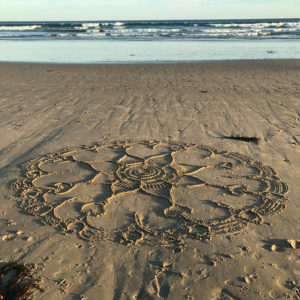 Allow two hours driving time from Orbost. 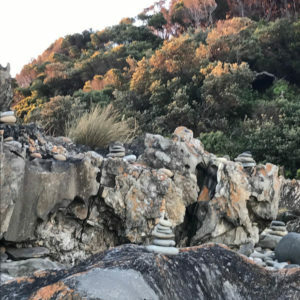 When we sea changed from St Kilda to East Gippsland we quickly discovered a passion for outdoor adventures. We tried tents. Sleeping on cold, hard ground wasn’t our style. 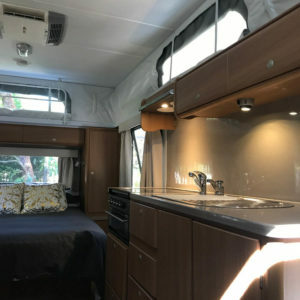 So we hired a Jayco Swan Outback and set off on our first adventure. This is where the nature-based travel spark ignited. 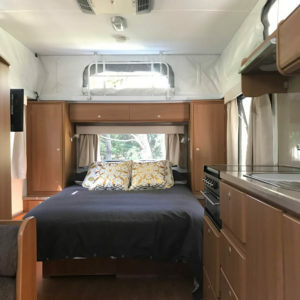 We bought our own camper and the love-affair for travelling continues to enrich our lives.